Home » A second life in pictures » One of those Days…. The days grow short; the nights grow long. Well, that was profound, wasn’t it? Obviously my future as a poetic genius is secured. It’s funny how different the season feels to me as a “real” Winter Queen. I don’t feel like hiding. I feel like going out, exploring, all those things. Of course, I’m sometimes very tired after, but instead of just sleeping quietly, I’ve become a bit stroppy, especially with Clutie, whose incessant cuteness just bugs me no end now for no reason I can understand except maybe just her, I don’t know, lightness or something. Which doesn’t make any sense. She’s always been annoying, but now I feel it on another level. Anyway, I went out into the Wylds to see how things looked. Anyway, I went out into the Wylds, to see how things looked. The waterfall behind me seemed ready to freeze, though I know it won’t. Things were glowing and beautiful, and the bare trees danced against the sky. Things were glowing and beautiful, and the bare trees danced against the sky. I felt alive and free, and much better about the darkening night, particularly when there is so much extra light from the Faery Aurora behind me. The glowing ferns made me feel happy to be alive. And I did spend a moment thanking Her Who gave me the world. And I did spend a moment thanking Her Who gave me the world. It seemed only right. For once, I didn’t feel small, as dawn rose over the stone circle and the aurora faded. I felt beautiful. Spiffy photos taken with the indispensible aid of my LumiPro. I never explore the Wylds on cold winter nights without it! 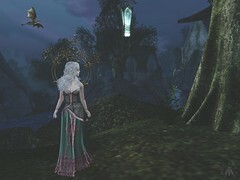 This entry was posted in A second life in pictures, Gwyneth and tagged Gauze, Lelutka, Lumae, LumiPro, Maitreya, Mandala, Mesange, Silvan Moon Designs, Wasabi Pills. Bookmark the permalink.